This screening is part of the Dublin Arabic Film Festival 2016. This film will be pre-ceded with the European premiere of new short by director Jim Sheridan 11th Hour. Starring the Mexican-American actor Salma Hayek, this eight minute short is set in a New York bar on the day of the 9/11 attacks. The script, by Jim Sheridan and Oskar Slingerland, is based on Irish journalist Lise Hand’s own experience of being in Manhattan on September 11th, 2001. 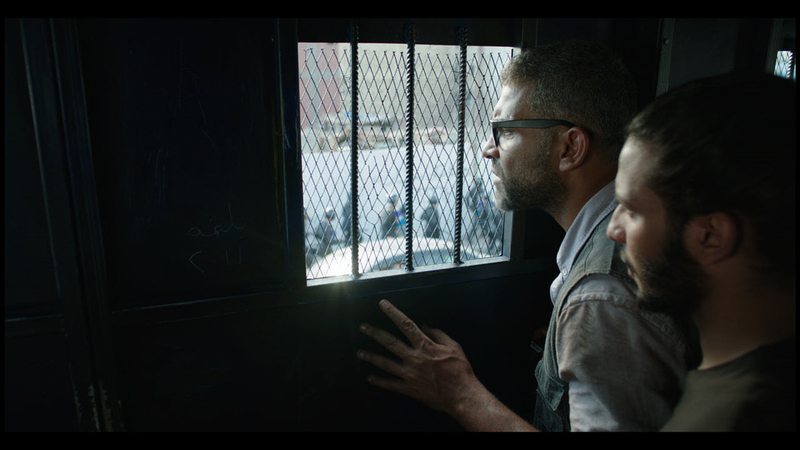 Egypt 2013, president Morsi has been toppled; as riots break out a disparate group is rounded up into a police van in director Mohamed Diab’s bracing political allegory, the opening film of the Un Certain regard strand at this year’s Cannes Film Festival. With great economy Diab restricts the action to the back of the truck where warring parties of all factions have been thrown together as civil war erupts around them – it’s revolutionaries against Islamic fundamentalists and both against the army. Diab brings real cinematic flair to the claustrophobic scenario, aided in no small way by his script, co-written by Khaled Diab, which delineates the complexities of multiple characters and their motivations in lucid fashion. COMPETITION: Win 2 tickets to this opening night screening, by entering our competition here.